Toronto, Canada— September 26, 2018— ISAAC, the International Society for Augmentative and Alternative Communication, is pleased to announce that October is designated as Augmentative and Alternative Communication (AAC) Awareness Month. This ISAAC initiative began in 2007. ISAAC’s goal is to create worldwide awareness about how AAC can help individuals with little or no speech, communicate using assistive technology tools and strategies to solve everyday communicative challenges. Notably, renowned physicist Professor Stephen Hawking was able to bring attention to the technology and people who use AAC devices. Hawking once said, “we have a moral duty to remove the barriers to participation, and to invest sufficient funding and expertise to unlock the vast potential of people with disabilities.” Support and devices have continued to evolve over the years, making it possible for him and others to communicate, both in spoken and written form. During this month, ISAAC engages its 15 Chapters around the world to plan and/or attend AAC awareness events in their communities, or participate in online events. Chapters are encouraged to shine a light on the visions and leadership capabilities people who use AAC toward future leadership opportunities – locally, nationally or internationally. ISAAC members include people who use AAC, their families, therapists, teachers, students, doctors, researchers, organizations and companies that make communication aids. 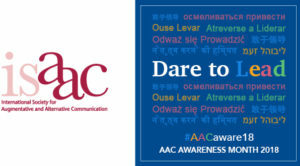 Visit isaac-online.org to learn about AAC awareness month activities happening around the world. Special thank you to this year’s initiative sponsor Attainment Company. Attainment Company is an independent, family-owned business based in Verona, Wisconsin, dedicated to helping people with disabilities succeed at school, work, and life. ABOUT ISAAC: The International Society for Augmentative and Alternative Communication (ISAAC) works to improve the lives of children and adults who use AAC. Augmentative and Alternative Communication (AAC) helps millions worldwide who cannot rely on their natural speech to communicate. The ISAAC Biennial Conference has been held every two years in a different location since 1984.